There's more to +Google Analytics than visits and pageviews. There's so much more that it can be overwhelming, especially if you're new to it. But, earlier this week, Google released a suite of Analytics Solutions that take you straight to the "good stuff" to help you understand the data from your blog faster than ever. 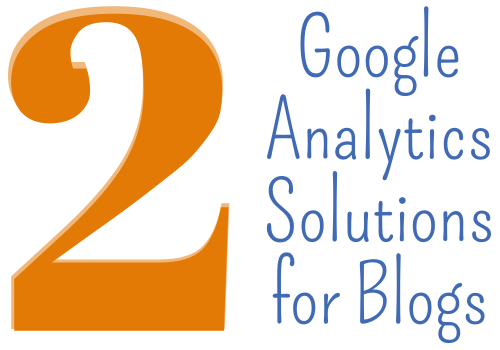 Bloggers on any platform can use these new tools — all you need is Google Analytics installed on your blog. It helps if you've used it enough to know your way around the interface, but you don't need to be an Analytics champion to put these new tools to work. You can browse the full collection of Analytics Solutions in the new Gallery. There are lots of them, and they're designed for many different purposes. So, I've gone through them all to find two great, easy-to-use solutions for bloggers. Let's check them out! If you get a lot of traffic from Google searches, you probably see (not provided) up near the top of your "Keywords" list on your Traffic Sources Overview screen in Analytics. The (not provided) "keyword" means that your visitor was logged into Google when they made the search that brought them to you. This is a privacy measure. As a Google user, I appreciate it. But, as a blogger, it's frustrating, because it makes it harder to determine what search terms brought readers to my blog. The (not provided) Analysis report doesn't reveal the search terms of your logged-in Googlers, but it does reveal what page those visitors landed on. This can give you a pretty good idea of what your readers were looking for when they found you. This custom report sets itself up for you with just a few clicks. To use it, go to the solutions gallery and set the first dropdown menu to "Custom Report", then look for "(not provided) Analysis" below. Click the "download" link under "(not provided) Analysis", and you'll go to a sign-in screen for Google Analytics. Once you've signed in, you'll be prompted to select a profile if you have more than one website tracked in your account. If you just have one, it will take you straight to that site's profile. As soon as the report is installed, you'll see the report screen. Here you can see the top landing pages for your (not provided) searches, along with other stats like visit percentage, bounce rate, and time on site. From this information, you can make an educated guess about what all those (not provided) visitors were seeking! To get to the report the next time you log in, click "Customization" in the banner at the top of the page and you'll see your custom reports in the left sidebar. Advanced segments let you focus on very specific types of traffic. I'm going to show you how to install and use the "Engaged Traffic" advanced segment so you can get a feel for what they can do for you. There are many more advanced segments in the Gallery, and you can get a complete explanation of how to use them in the Google Analytics documentation. The "Engaged Traffic" advanced segment helps you learn more about the readers who enjoy your site the most — in analytics terms, the readers that view more than 3 pages on your blog and stay for more than 3 minutes. Using this advanced segment, you can find out where in the world they're coming from, what pages they read, what brought them to your blog, and much more. If you have AdSense associated with your Google Analytics account, you can also see how much AdSense revenue readers in this group brought you. To add the "Engaged Traffic" segment to your blog, set the first dropdown menu in the solutions gallery to "Advanced Segment", then click the "download" link under "Engaged Traffic". On the next screen, choose the profile to apply the segment too (if you have more than one profile), and rename the segment if you like. It defaults to "Really Engaged Traffic", which works for me! After you've decided on the name, press the "Create" button. On the next screen, you'll see that the parameters for the advanced segment have already been filled in. The "Page Depth" of 3 means that it will show visits with 3 or more pageviews. The "Visit Duration" of 180 means that it will show visits over 3 minutes (click the image to enlarge). 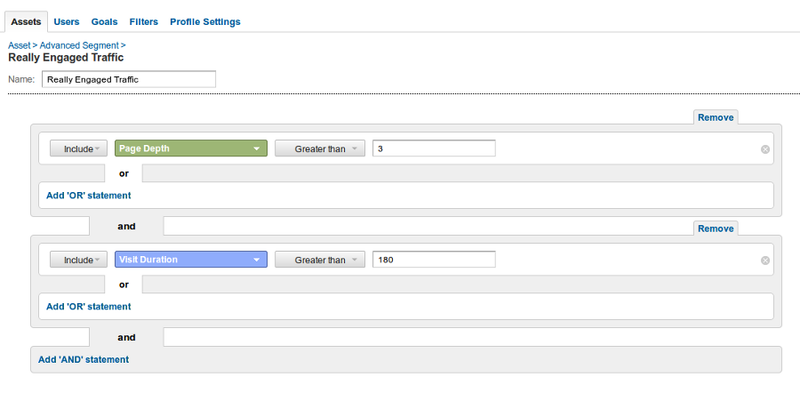 Press the "Save Segment" button at the bottom of the page to add the segment to your account. 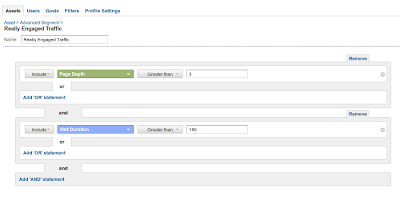 Once you've set up your advanced segment, you can apply it to any Google Analytics report by clicking "Advanced Segments" near in the top navigation and clicking the checkbox next to your advanced segment (click to enlarge the screenshot). If I wanted to find out which pages of my blog the Really Engaged Readers liked best, I'd go to the Content > Overview report and activate the "Really Engaged Readers" segment. The top ten pages my most engaged readers visited will show up at the bottom of the page. It's interesting to compare the favorite pages of engaged visitors with the pages that are popular with the average visitor — sometimes they're just about the same, but they can be surprisingly different. Your most engaged visitors are often your biggest fans, so use the information you gather here to plan new content that makes them smile! Now that you've been introduced to Google Analytics Solutions, you're ready to experiment. Take a little time to browse through the gallery and try out a new solution. Feel free to experiment and try different solutions, even if you're just curious about what they do. You can't hurt your blog or your data by trying out different solutions, so don't hold back!